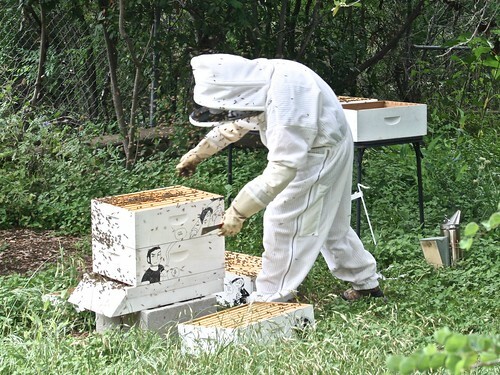 On March 31st, I installed a new queen in Knives’s hive. I came back the following week to confirm she had been successfully released and laying well. This week I wanted to do a more thorough inspection to gauge the health of the hive as it had been queenless for almost a month. I was greeted with a wonderful sight in the topmost super. Here is Knives 2.0 in all her glory. The very top super had a bunch of frames with a combination of eggs and capped brood. All seemed to be going well until I started going down deeper into the hive. It appears Knives 2.0 is just hanging out in the very top box and isn’t laying anywhere else. Since I knew where she was, I decided to move the super with the queen to the very bottom to get the brood nest going again in the first few supers. The bees weren’t really happy about this. I’m hoping this is the last time I have to completely rearrange this hive. If the brood nest gets reestablished in the first three supers, this hive will be well on the road to recovery. 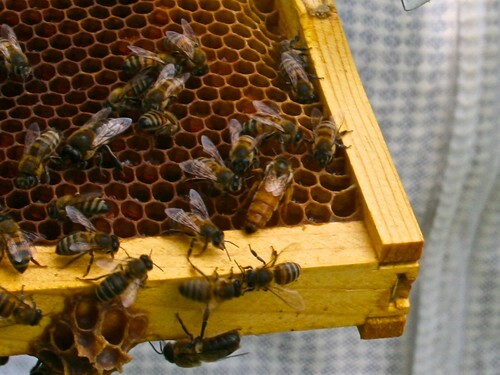 I’m also looking forward to this queen producing some slightly less hot bees. 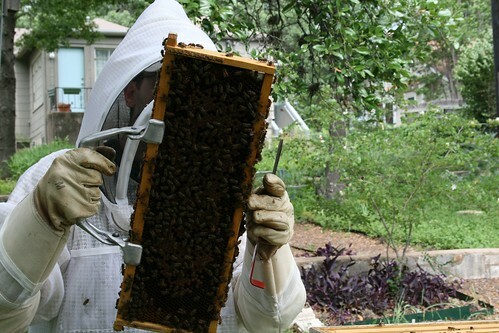 They aren’t too bad now, but they do tend to get worked up when inspecting deep into the hive. That’s a juicy-looking Knives 2.0. Here’s hoping she’s a productive and gentle breeder! No kidding. I’ve already reached my quota for 2012 on angry aggressive bees.